PhysX FluidMark has two PhysX paths: GPU and CPU. The GPU path is the hardware accelerated path and is supported on GeForce 8, 9, GTX200 and GTX400 series and, according to NVIDIA docs, only on GPUs with more than 32 cores (I haven’t had yet the opportunity to test this point). The GPU path is the fastest way for the rendering of fluids but this high speed has a cost: there is a limitation on the number of particles (a fluid is made up of particles). A hardware fluid (read a fluid simulated on the GPU) can’t have more than 64k particles. This limitation does not exist with CPU PhysX. The only limitations with CPU PhysX are the amount of memory available (not really a limitation today) and the speed of CPU. So I said a GPU fluid is limited to 64k particles. In FluidMark you can control the number of fluids with the emitters number. Then in theory, if you want 120’000 (120k) or 180’000 (180k) particles for example, just set the particle count to 180’000 and select 3 emitters (because 180k/3 = 60k which is supported). But in practice, you can’t set the number of emitters you want (emitter = fluid in FluidMark) otherwise you’ll get a failure or / and a crash of the application and in the worst case the corruption of the display driver leading to a reboot. This limitation remains unclear for me and the failure seems to come from the PhysX engine. I’ll try to see the source of the bug (my code or PhysX engine) with NV. Like the previous limitation, this one does not exist with CPU PhysX. 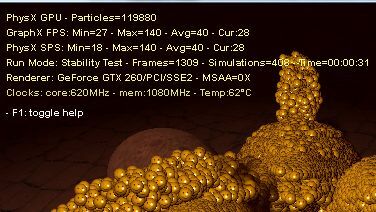 Here are the results of some tests on a GTX 260 + R197.45 + PhysX 9.10.0129 + Win7 64-bit. Each time a failure occurs, the PhysX engine generates a file called memory_failure_log.txt in FluidMark folder. Mmm… I got the same resutlts with 180’000 particles, but with 200’000 and 3 emitters works fine reaching 194’805 running on a GTX 260 + R197.57 + PhysX 9.10.0129 + Win7 64-bit. I have set the number of particles to 120k and emitters to 7 and after hitting the 64k number of particles, they just disappear and test is going normally without them. I have 8600 GT.